This unique cycling tour traces some of the far reaches of the Khmer Empire while also following the Mekong River from Thailand, through Southern Laos and into Cambodia, providing a perfect setting to experience the cultural heritage and scenic highlights of these three countries. Our tour begins in Thailand but we quickly cross into Laos and first head up to the Bolaven Plateau, the coffee growing area of Laos, before heading south, where we see our first Khmer Hindu temple complex, Wat Phu. This temple is unique in that elements were bathed in water from a mountain spring. Heading further south we go island hopping and observe the daily lives of the farmers in the paddy fields and the fishermen on the Mekong River. We spend some time dolphin spotting and relaxing on an island in the middle of the Mekong before crossing into Cambodia. After one more night on the Mekong we head to Preah Vihear, arguably the Khmer Hindu temple which has the most spectacular setting of all the temples built during the six-centuries-long Khmer Empire. Next we wind our way to Siem Reap, stopping en route to see the unique pyramid temple at the ancient capital of Koh Ker. Then it's time to explore by bike the Khmer Empire’s greatest legacy, the amazing Angkor complex which bears testimony to the immense power and wealth, as well as the variety of belief systems that the empire patronised over time - Hinduism, Mahayana Buddhism, and Theravada Buddhism. Arrive in Ubon Ratchathani and transfer to overnight at a hotel on Mekong River. Cross the border into Laos and ride the coffee-growing region of the Bolaven Plateau. After a stop at the 200-m high Tad Fane Waterfall, we cycle to our tranquil resort in the middle of a coffee plantation. A mostly downhill ride to an ethnic village and then on to lunch at the Tad Lo Waterfall. A transfer takes us to Champasak and Wat Phu, our first Khmer Hindu temple complex of the tour. We cross the Mekong many times today. First to cycle on an island, then to see Phu Asa, a curious site of stone towers. Late in the afternoon, we have a very short crossing to the island of Don Khone. We cycle from island to island, with the assistance of some boats. Hard to believe we are in the middle of a river! A rest day to chill out and enjoy the tranquil island of Don Khone. Cross the Laos-Cambodia border and cycle down the Mekong to Stung Treng. A unique opportunity to visit Preah Vihear, a Khmer temple listed as a UNESCO World Heritage Site. Uniquely situated at the top of a cliff, it provides stunning views of the Cambodian countryside. We ride from temple to temple in the ancient capital of Koh Ker. Many of these temples are still in the middle of the jungle and have not been touched, providing a different aspect to the Khmer Empire. We then transfer to Siem Reap. We take in the splendour that is the ancient capital of Khmer Empire, Angkor Temple complex. By bicycle is the best way to see these amazing structures. A longer cycle today through the countryside to see unique carvings in a river. One more temple has to be included as Banteay Srei is known for its intricate carvings. A change of pace today, we trade our bikes for kayaks to explore the floating villages on the largest freshwater lake in South East Asia. A farewell dinner marks the end of exploration of the Khmer Empire, then back to Siem Reap to end our trip. Free time until onward travel. Day 2 - Khong Jiam - Tad Fane - Sinook Ride 40km. +390m / -347m. January was an excellent time to explore this area as the temperature was consistently around 30c. We had awesome local guides and drivers for each country. The terrain was a variety of tarmac, sand and trails through the countryside. The combination of biking, visiting sites and eating local food was a great way to explore these countries. We were also pleased with the variety of accommodation. This was our fourth SpiceRoads tour. We appreciate the level of professionalism all staff display as well as the awesome planning that goes into all the trips to ensure the clients safety and enjoyment. We enjoyed our SpiceRoads tour very much and thought it extremely well organized with excellent guides and drivers. We had a few specific recommendations on your Khmer Explorer tour — things we thought didn’t work that well and might be changed or modified — but on the whole, we thought you offer excellent value for money and would recommend your company highly. Dear Spice Roads, I am writing you again about my fabulous trip in Jan 2016 thru Laos, Cambodia, and into Thailand. Mr Bota Sin was our 2nd guide while in Cambodia. Mr. Bota Sin was a great guide! I will and have recommended him to my friends that wish to bike travel thru Cambodia. He is attentive to all details, stays completely attuned to the needs of the biking group. For example, I was one of the back of the line riders and he made sure I was never alone or behind. He made sure we had frequent rest/food stops as the climate was much more humid and hotter than what we were used to. He is very educated and it was a pleasure to converse with him on a wide variety of subjects. His language skills are proficient! Bota is very hard working, no detail too small to attend to, and never "off duty". Please include Mr Bota Sin as a guide in your tours. Your clients will be superbly taken care of and will have an incredible experience which will only keep clients coming to your tours! I know when I come back, I will ask for Mr Bota Sin and recommend him to my friends! ps. 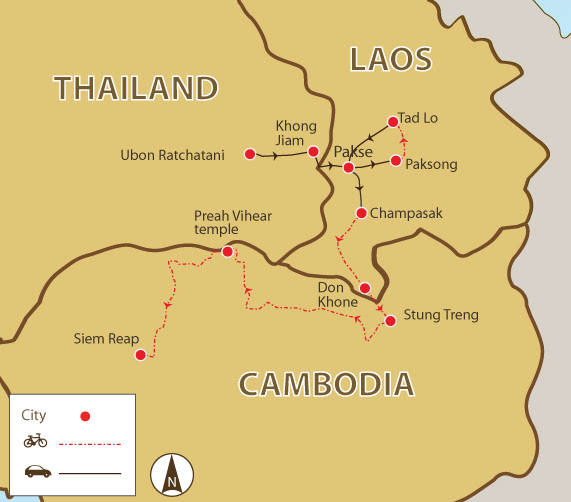 this was my 3rd trip through Cambodia, Vietnam, Laos, by bike. I can say due to the care of Mr Bota Sin, that it was one of my favorites! Our bicycle journey will be on quiet back roads where you’ll have to look out for dogs and ducks more often than cars. We cover just under 500 kilometres in 10 cycling days, and much, if not most, of the terrain is quite flat. There are some great natural attractions, including the chance to spot the endangered Irrawaddy dolphin. For archaeology and history buffs, there is plenty to delve into, making this one tour that has absolutely something for everyone. Suitability: This ride is great for novices and experts alike. Most of this ride is flat with a few small climbs. The road surfaces are generally very good and so make for easier riding. Anyone who has moderate fitness will enjoy this tour. If you are in doubt, please contact us for advice or a list of references. Biking Conditions: The road surfaces are mixed: most days, we ride on reasonably good quality asphalt roads, but there are enough sections on very badly broken or dirt tracks that you will need a mountain bike, preferably one with front shocks. However, there is nothing technical involved on this tour, and anyone, assuming they are fit enough, will be able to join no matter how little cycling experience they have. A support truck is always available to help. Arrive in Ubon Ratchatani and be met by your transfer to the hotel on the banks of the Mekong River. Dinner will be arranged at the hotel, and you will be met by your guide in the morning. After breakfast, your guide will pick you up for the short drive to the Thai-Lao border at Chongmek. Once visa formalities have been completed, we transfer for about 2 hours to begin our journey into the coffee growing area of Laos: the Bolaven Plateau. We stop for lunch at Tad Fane Waterfall. Then it's on the bikes to cycle to our coffee resort for an overnight. We start with a gentle uphill of 10 km to the town of Paksong. Then the road evens out before we roll down to the resort complete with coffee shop. After a fresh cup of local coffee, we ride on to Tha Teng on a quiet road, passing villages and lots of cheering children. We take a break at a Katou village to see how they roast coffee and learn why there are empty coffins under the houses. Then it’s an easy downhill, and from the junction, it’s only 5 km to Tad Lo Waterfall where we have lunch. We then transfer to the start of our afternoon ride. We start cycling on a flat tarmac road, passing through the former colonial town of Champasak, which stretches along the Mekong River. We ride 8 km on to Wat Phu, a Khmer Hindu temple complex dating back to the 5th century. We'll have time to explore this fascinating place before we head back to Champasak and overnight at our riverside resort. We start the day with a short cycle to catch a ferry to Don Daeng Island and go for a short ride around the island. Then we take a ferry ride to the other side of the river and ride to the village of Ban Niet Ngong. Once we reach the village, we can opt to ride or walk up to see Phu Asa, a curious site of stone towers. We have lunch here and then ride back down to the main junction before we load up the vans for a transfer to Ban Hat. We cross back over the Mekong to one of the biggest of the islands in this mighty river, Don Khong. Arriving in the late afternoon will give you time to walk along the river and watch as the locals make full use of the river. Today, we island hop! We have an early start and ride around Don Khong and along the banks of the river to the ferry, stopping along the way to see locals making palm sugar. When we reach the ferry, it's only 200 m to Don Som, one of the longest islands in the Mekong that stretches about 12 km to where it meets the tip of Don Det. It's another quick ferry ride to Don Det, and we cycle along a dirt path to the old French Railway bridge and cross over to Don Khone, where we ride straight to boats for a leisurely cruise in search of the nearly extinct Irrawaddy dolphins. We then ride the 4 km to our riverside hotel. A varied ride over four islands on narrow dirt tracks means there’ll be no vehicle support, but we will still stop for water and snack breaks. A well-deserved rest day gives you a chance to enjoy this tranquil island. Wander through the peaceful village, discover typical Buddhist temples, or remnants left behind by the French - the old pier, a decayed railway bridge, and colonial villas. Or spend the day swimming, sunbathing, and perhaps spotting the elusive Irrawaddy dolphins. We depart Don Khone by boat and transfer to the Lao-Cambodian border. After crossing the border, we meet our Cambodian guide and start riding south on a quiet road through green fields and forests. The scenery is very different from Laos, and the quietness of the area will give you an “alone on the planet” feeling. We have two stops before we reach Stung Treng, a bustling trading town at the confluence of the Sekong and Mekong Rivers. We wake early and transfer about two hours to our starting point near the Kulen Promtep Wildlife Sanctuary. This tarmac road travels through the eastern edge of the sanctuary. Keep an eye out for the brilliant birds and small creatures that frequent the area. We come through the other side of the sanctuary near the town of Sra’em, the gateway to the temple of Preah Vihear. We carry on another 20 km to the entrance from where we take a 4WD vehicle to the top, as the temple is situated atop a 525-m cliff. A Hindu temple, Preah Vihear has the most spectacular setting of all the temples built during the six-centuries-long Khmer Empire. The temple is not yet restored but has spectacular carvings and lintels. The unique temple design and setting are the reason UNESCO listed Preah Vihear as a World Heritage Site. After our visit, we transfer to our hotel. After breakfast we have an early morning transfer to the ancient capital of Koh Ker, built in 922 AD. Located in a remote area with many temples still hidden in the jungle, the highlight is the unique seven tiered and 36-metre (118 ft) high pyramid, which probably served as a state temple of Jayavarman IV. Following our visit we'll cycle through rolling hills toward Beng Mealea temple, where you'll feel like an explorer when you discover the completely overgrown temple. It has only recently been made accessible and remains unrestored. There'll be time to trek through the jungle ruins before we have lunch. After our meal we’ll transfer to Siem Reap and direct to our hotel for check in. This morning, we start our bike ride to the entrance of the Angkor Temple complex. We enter from the south and traverse up portions of tarmac road and jungle paths until we reach our first temple, Tah Prohm. After our visit, we carry on through the jungle and toward the eastern gate of Angkor Thom, ancient capital of the Khmer Empire. Near the centre of this massive enclosure, we find the enigmatic temple of Bayon. This temple is known for its many smiling faces. As the sun reaches its zenith, we take a short rest and lunch, before visiting the grandest temple of them all, Angkor Wat. Depending on time, we can choose to return to Siem Reap after our visit for a brief rest before returning to the Angkor complex. This evening, we’ll enjoy a beautiful sunset in the Angkor Park and return to our hotel by transfer. Leaving Siem Reap by bike, we strike out for the countryside. Our initial destination is the village of Pradak, which lies not far from the temple complex. Once we pass through this quaint little village, we cycle down a narrow tarmac lane to Banteay Samre. Now, we start getting deeper into the Cambodian countryside and pass many local villages and schools and people going about their day to day business. Ahead of us, the great sandstone ridge of Phnom Kulen rises from the countryside. At the base of the mountain, we put our bikes aside and take a short 3-km moderate trek uphill through jungle to a river bed with submersed carvings and a beautiful waterfall (in rainy season only). The ancient riverbed with carvings of Hindu gods is known as Kbal Spean, or the River of 1,000 Lingas. Once we finish here, we load up our bikes and transfer to Banteay Srei, the gem of the Angkor area, known for its exquisite bas-relief carvings. After our visit, we return to Siem Reap. Our destination today is the famous Tonle Sap, South East Asia’s largest freshwater lake with its size varying greatly depending on the season, as it swells to about four times its size during the wet season. We explore this magnificent natural marvel by kayak. Two-seated kayaks are one of the best ways to see the lake, as they can go where the noisy, long-tailed boats cannot. We paddle through sunken fields and floating forests to the village of Kampong Kleang, where we enjoy lunch at a local stilted home perched in the lake. Then it’s back to solid ground and on the bikes to return to Siem Reap. Once back in town, we meet up for a farewell dinner. You are free in the morning after breakfast until we transfer you to the airport.